I would like to introduce Trinity’s hunger initiative. The Trinity Hunger initiative is our school’s project to fight hunger in Victoria. It helps the homeless, the food bank, those who are less fortunate, and the Communities in Schools program offered by VISD. For this project students were asked to create a design to go on a reusable grocery bag. Among all of the designs I am honored to say that me and my chapel buddies Maely B. and Anaya K.'s design was chosen for this years bag. The theme for this year was “Be kind, Be Loving, Be Thankful.” To symbolize those 3 things we drew a heart to symbolize to be loving and flowers within the heart to remind us to be kind. If you have kindness and love in your heart your will be thankful. 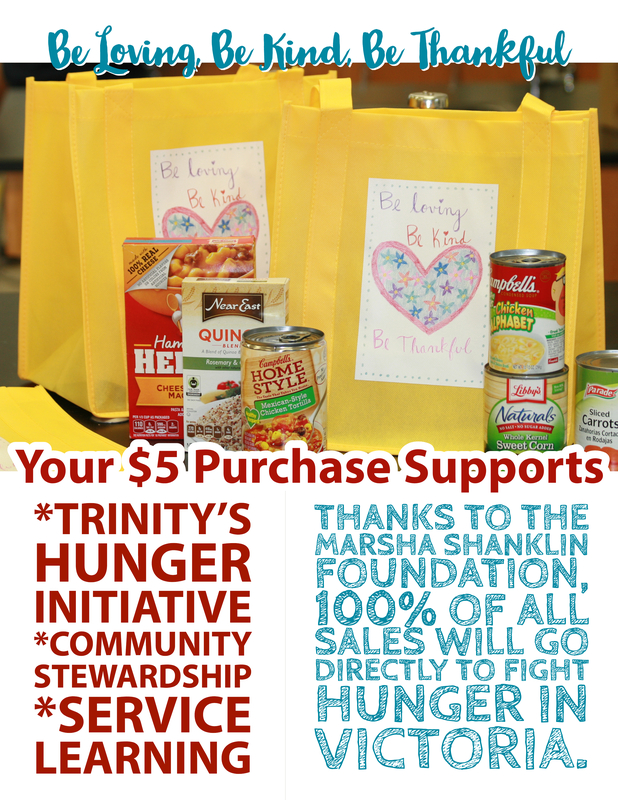 These reusable grocery bags will be sold to raise money for the Trinity Hunger initiative. 100% of the money raised will go to Trinity’s Hunger initiative. Please help us by purchasing these bags today and throughout the school year. Remember to be thankful for your blessings, to be loving to the earth around you, and to always be kind.